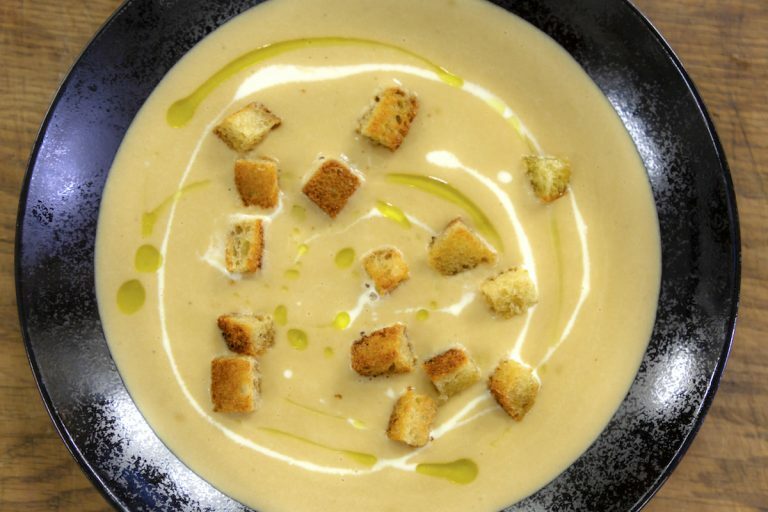 This simple, classy soup has tonnes of flavour. It is made with sherry, double cream, stock and large Spanish style onions. This cooks more quickly than a French onions soup and is completely delicious. Great as a starter or a light lunch! Place the onions into a hot saucepan with 15ml of olive oil. Cook until coloured then add the sherry and stock. Cook for 10-15 minutes. Add the cream to the soup and season. Blitz in a liquidiser until smooth. Pour the mixture back in the pan to warm through. For the croutons, warm the butter in a frying pan until foaming. Add the cubes of bread and fry until golden brown. To serve; spoon into bowls, drizzle with oil and cream. Scatter the croutons into the soup.